See also Viola's 'He Weeps For You' (1976) in AEM. ‘We live in the mechanical age. Painted canvas and upright plaster no longer hace a reason to exist. We need a change is essence and in form. We need to go beyond painting, sculpture, poetry and music. We need a greater art in harmony with the requirements of the new issue.’ - Lucio Fontana, "White Manifesto" 1946 (in AEM, p, 194). The use of video and exploration of the moving image can definitely be seen as a change from traditional art forms. Bill Viola has been a pioneer in the use of video and the exploration of the moving image, creating single-channel videotapes, installations, and a range of artworks that reflect his deep engagement with art history, spirituality, and conceptual, as well as perceptual, issues. The artwork ‘Going Forth By Day’ explores themes of human existence: individuality, society, birth, death, rebirth. Commissioned by the Deutsche Guggenheim, Berlin, the work is experienced architecturally, with all five image-sequences playing simultaneously in one large gallery. Entering the space, as a visitor you literally step into the light pf the first image. Once inside, you stand at the center of an image-sound world with projections on every wall. The story told by each panel is embedded within the larger narrative cycle of the room. As a visitor you are free to move around the space. Panels are either to be watched individually or as a whole experience. Video of "The Deluge," part of the Going Forth by Day cycle. ’The five image sequences are each approximately thirty-five minutes in length and play simultaneously on continuous loops. Sound from each panel mixes freely with the space, creating an overall acoustic ambience. The images are projected directly onto the walls—without screens or framed supports—as in Italian Renaissance frescoes, where the paint was applied directly onto the wet plaster surface of the walls. The title of the work derives from a literal translation of the title of the Egyptian Book of the Dead, "The Book of Going Forth by Day"—a guide for the soul once it is freed from the darkness of the body to finally "go forth by the light of day.’ " Exhibition curator John G. Hanhardt states, "Together, the suite of works serves to create an epic articulation of the passage of nature's cycles and offers mythic reflections on the temporal flow of birth and regeneration" (2). ‘As the viewer passes through the entryway, he/she will walk through "Fire Birth," a large image of a body submerged in flaming red water, an allusion to the world ending in fire and beginning in water. 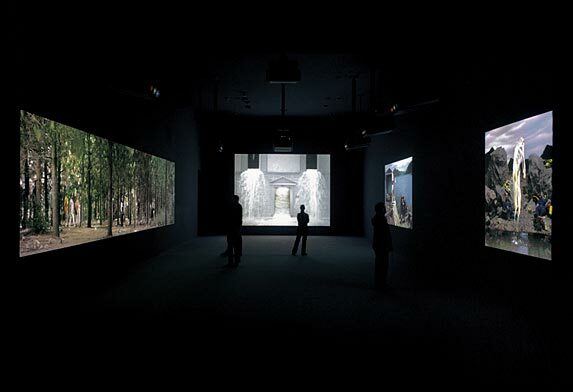 On the left wall of the gallery, the panel "The Path" is projected, a long, panoramic moving image of individuals walking through a wooded environment; a flow of humanity engaged in a never ending journey. The facing wall features the panel "The Deluge," which depicts the façade of a building with people fleeing a deluge of water that bursts out of the building. On the right gallery wall is the panel "The Voyage," which suggests a narrative of passage, as a dying old man in a house overlooking a large body of water, has a boat prepared to depart for the far shore. The final panel, "First Light," shows a landscape at dawn with a group of rescue workers, who, exhausted by their efforts to save lives after a catastrophe, finally succumb to sleep; as they sleep, a man silently rises out from the water into the heavens. Bill Viola's images are designed to the echo the Renaissance fresco painting. The images are projected directly on the wall, no framing mechanism has been used. You could say that the combination of religion and modern art installations is quite remarkable. Though here, Viola did a great job putting all the elements in harmony.